Dry Cold Front Arrives Wednesday Morning. Warm Today & Even Warmer Tomorrow. Oops, I corrected the header & arrival time of the cold front. Cold Front Brings Cooler Weather. 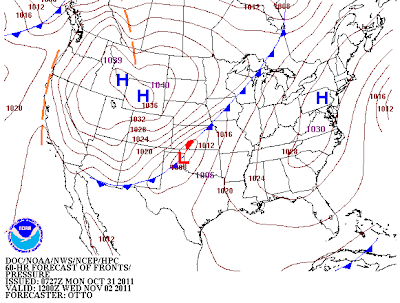 NWS HPC Forecast Position Of The Cold Front. Valid At 6 AM MDT Wed Nov 2, 2011.
storm associated with it moves across northern New Mexico. and behind the cold front as it moves southward. NWS HPC Forecast Low Temps Thursday Morning. A cold morning is on tap for the local area Thursday morning. 30 across the rest of SE NM. 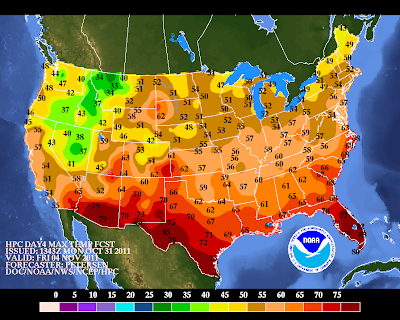 NWS HPC Forecast High Temps Thursday Afternoon. temperatures in the upper 50's to the low 60's. NWS HPC Forecast High Temps Friday Afternoon. 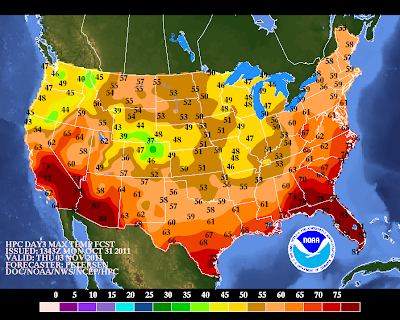 Maps Are Courtesy Of The NWS HPC. the local area. 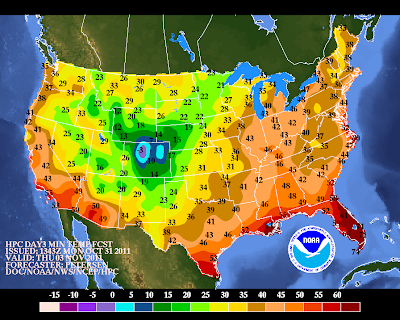 Highs temps of 80-85 are expected.